20 years after the events of Tron, Alan Bradley's son, Jet, enters the Electronic World to battle the evil machinations of fCon, the company that has bought out ENCOM. Tron 2.0 is a "first-person shooter" video game released in 2003 which was a sequel to the 1982 film, Tron. Bruce Boxleitner returns as Alan Bradley. In the timeline, Alan is a widower, having earlier married Lora, now deceased. Cindy Morgan (who played Lora in the film) returns in the video game as the voice of Ma3a, Alan's AI program. Though some story details of Tron 2.0 are similar to the film Tron: Legacy and its spinoffs, there are also elements which render it non-canonical in the franchise as it currently exists, such as Lora still living and married to Alan in the film; additionally, Legacy director Joe Kosinski has confirmed that Tron 2.0 and its spinoffs are not considered canonical, despite the similarities. Actress and model Rebecca Romijn-Stamos voices the character of Mercury. Music was composed by Wendy Carlos, who also scored Tron. Syd Mead, the conceptual artist of Tron, contributes a new version of the Light Cycle. The company Digital Eclipse made a game for the GameBoy Advance called Tron 2.0 Killer App (sort of a parallel game to the Xbox version of Tron 2.0). It is different from the main Tron 2.0 game in that the story (such as it is) features the characters of Tron and Mercury attempting to destroy a virus created by the Corrupter in the ENCOM system. It is unknown where this story falls chronologically, but the appearance of Mercury might argue that it takes place around the same time as the main Tron 2.0 game; this would suggest that Tron still lives even after what, for him, has been about 1000 years since the events of the original film (time progresses more quickly subjectively in the Electronic World)! Also in 2003, comic book publisher 88 MPH solicited a comic book called Tron 2.0: Derezzed which was to chronicle the story told in the video game. However no issues were ever published and I believe the publisher has since folded. In 2006, publisher Slave Labor Graphics began publishing Tron: Ghost in the Machine, a 6-issue mini-series sequel to the story of the Tron 2.0 game, a study of which is also available here on PopApostle. "Ghost in the Machine" Part 1 states that it takes place 6 months after this story, in April 2006. This places Tron 2.0 in November 2005. This page uses content from Wikipedia. The original story summary was at Tron 2.0. The list of authors can be seen in the page history. The text of Wikipedia is available under the GNU Free Documentation License. The story is centered around Alan's son Jethro ("Jet") Bradley. Since the film's events, ENCOM has been taken over by a company called Future Control Industries (fCon). After talking with his father who is kidnapped while on the phone with Jet, Jet is digitized by Ma3a, Alan's AI computer system, to aid her in combating Thorne, an executive from fCon who was improperly digitized into the computer and is now a corruption spreading like a virus throughout the system. Jet is quickly, and mistakenly, identified as the source of the corruption, and is captured by Kernel, the systems security control program. After deciding that Jet, who claims to be a User, is corrupted, Kernel spares Jet on the recommendation of Mercury, another program tasked to help Ma3a, and Jet is sent to be used as a bot in the lightcycles game program. After winning several matches, Jet escapes the match with Mercury's help. After they find Ma3a, the server, corrupted beyond saving, is reformatted resulting in Mercury's demise. Jet escapes to the internet with Ma3a and an uncompiled copy of Tron Legacy, an update to the original Tron program written by Alan Bradley to protect Ma3a. After finding a compiling program on the Internet, Thorne appears to kill Ma3a, as the Tron code is compiled and attached to her program. During this, Jet receives a communication from Guest, the User who had assigned Mercury to help Jet. Accessing a video uplink, Jet realizes too late that Guest is his father Alan, locked in a storage closet by fCon higher ups Bazra, Popoff, and Crowne, begging him not to compile the Legacy program. Legacy activates, revealing that its sole function is to kill any User in the digital world. Jet escapes, and fCon inadvertently saves him by capturing Ma3a in a search program. Having recovered the correction algorithms necessary to digitize a human, Alan is used as a guinea pig, and is sent to Thorne's corrupted server. Assisting the ICPs and Kernel, Jet reaches Thorne at the heart of the server and kills the Kernel before he can derez Thorne. Thorne, regaining a moment of lucidity, begs for forgiveness then tells Jet how to enter fCon's server. Alan and Jet break into fCon's virtual server, which the corporation is planning to use to distribute Datawraiths - digitized human hackers - across the worldwide information network to give it unparalleled power and influence. After Alan and Jet crash the server, the CEO of fCon (most likely Dillinger from the original Tron movie, though this is never confirmed) orders Bazra, Popoff, and Crowne into the system themselves to deal with Alan and Jet. However, Alan, wanting to verify the purity of the correction algorithms, removes them to inspect them as the three are being digitized, resulting in a monstrous amalgam of the three, which chases Jet into the digitizing beam. Jet diverts the three out of the beam and finally escapes the computer. When Thorne turns a normal program into one of his followers, the lighting of their circuits turns from blue to yellow. The Tron arcade game being played by Jet in the employee break room is very similar, but not exact, to the real word Tron arcade game cabinet when it came out in 1982 from Bally Midway in conjunction with the film. There are also posters for Space Paranoids and Light Cycle hanging on the wall. At the beginning of the game, an fCon employee asks Jet if his father would mind if he has some of his popcorn, a callback to the scene in Tron where Roy Kleinberg asks him if he can have some of his popcorn. (This joke is visited again in "The Next Day".) The tabletop popcorn machine it was apparently popped with appears to be a Presto Popcorn Pumper. When Jet is on the phone with his father at the beginning of the game, some video game sound effects are heard in the background even though he is no longer playing the game, nor is anyone else! Ma3a stands for Math Assistant 3 Audio. Ma3a was preceded by two earlier versions, Ma1a and Ma2a. Ma1a was designed by Lora as an AI research assistant. After Lora's death in a lab accident, Alan designed Ma2a which had many similarities to Lora's personality, leading to rumors that Alan had somehow integrated Lora's partially digitized DNA (an email with the subject "Digitizing Technology" dated Oct. 94 reveals that Lora died in a "misfiring laser" mishap in the digitizing lab of ENCOM) into the program. Flaws in Ma2a were corrected in version 3, Ma3a. What appears similar to a Bit, but is actually a Byte, greets Jet when he arrives in the Electronic World, quickly demonstrating that it is capable of speaking full sentences, not just the yes/no answers of Flynn's bit seen in Tron. In computing terminology, a byte is a piece of digital information usually consisting of eight bits, with a possible 256 combinations. Jet encounters small creatures in the Electronic World which Byte explains are Code Optimization Wares, grazing on excess code. Notice that Code Optimization Ware abbreviates to the acronym COW! The security control program is named Kernel. In computer parlance, a kernel is the central module of an operating system, providing constant management of memory, processes, tasks, and disks. Kernal refers to his foot soldiers as Regulars. This may be a reference to "regular expressions" in computer science, a string of characters used in search or find-and-replace functions. One of the programs Jet plays against in the light cycle arena is named Crom. We don't learn anything about this program, so it is unknown if there is any relationship to the Crom program who appeared in Tron and was derezzed on the game grid by Sark. Other programs seen in the light cycle arena have names related to computing or graphics terms, such as Sim, Lan, and TwoD (Simulation; Local Area Network; Two-dimensional). During the light cycle races, Jet is told that Mercury has never been defeated and he asks another program if she's really that good and get's the response, "Is a beta version buggy?" In computing terminology, a beta version is software that is released for testing after all of the applications features have been added; beta testers will use the beta version software and report the problems or "bugs" that turn up so they can be fixed before the final product is released to consumers for purchase. During his adventure in the Electronic World, Jet (and Mercury) receive communications from Guest, a user in the real world (who is later revealed to be Alan himself). The term "guest" is used in many operating systems to temporarily identify an anonymous user logged into the system. In Tron, it seemed that a rod was useful only for generating a light cycle. In this game, several different types of rod are used: a rod primitive, which generates a light cycle and can be used as a weapon similar to a cattle prod; a suffusion rod, which fires energy blasts; a LOL rifle, which is basically a digital sniper rifle; and the rod rifle, which can form a gun on the using program's arms, firing very powerful blasts, but which weaken the program significantly. The LOL is named for the web-speak acronym LOL which means Laugh Out Loud. Ma3a refers to Alan as Alan1 and Jet, being Alan's son, as Alan2 (until he corrects her later in the game to call him Jet). One of the programs Jet encounters asks him, "What do you think this is, Pong?" Pong was the first successful arcade video game. According to Ma3a, Alan had computed that a user is 526 times more powerful working from inside the system than from without. The game also features Alan's updated version of the Tron program called Tron Legacy (no relation to the Tron: Legacy film), designed to eliminate Users in the Electronic World. An email in the game reveals that a flaw in the program causes it to target all Users instead of just unauthorized ones. Alan developed the Legacy program to protect Ma3a and it was designed to eliminate any Users in the Electronic World who threaten her. It seems like a harsh step to take for a decent guy like Alan! This may be a clue that Lora's personality really is inside of Ma3a and he would therefore protect her at virtually (pun intended) any cost. In computer terms, "legacy" describes outdated software or equipment still in use in a computer system's environment. It seems odd that Alan would use the word as part of his program name, but he may have chosen the name Tron Legacy to suggest the return of the "righteous" Tron program who defeated the MCP and freed the denizens of the Electronic World from the MCP's enslavement. Digital bots called Finders are depicted scanning stacks of data. The name may have been derived from the Apple file manager and graphical user interface shell used on Macintosh operating systems. At one point in the game, the System detects unauthorized packets. A packet is a unit of data carried through a network switch. Giant worm-like programs called seekers appear in this game. Their purple coloring indicates they are fCon software. They are sort of like search engines, seeking (and often destroying) specific things or programs, such as Jet and Ma3a. The resource hogs exploder.exe, ImageShop5.0.exe, inlook.exe, netscope.exe, and reelplyr.exe are parody names of real world software programs (Windows) Explorer, PhotoShop, Outlook, Netscape, and RealPlayer. In the old EN12-82 system, Jet overclocks the system in order to allow Ma3a to enter. Overclocking is an actual computer term for increasing the speed of a computer beyond its manufacturer's recommendations. During the course of the game, Jet spends time in Internet City. He is plagued by (parody) banner ads when he first enters the city! Two of the viruses found in Internet City, Durandal and Ra*mpa^ncy, are references to the 1994 Apple Macintosh game, Marathon. In the game, off-duty programs are known to relax at the Progress Bar. In operating system terminology, a progress bar is a graphical representation of the progress of a task such as copying files from one location to another. The game reveals that one of Flynn's old email hosts is anotheremail.com. This is, of course, a fictitious domain. The ENCOM domain is seen to be en.com. 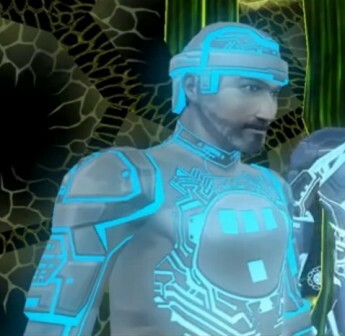 When Alan is sent into the Electronic World, he appears wearing what is essentially a duplicate of Tron's armor with the T shape on the chest! During the battle inside the fCon server, Jet faces many opposing programs, such as morton_disc_scan.exe, and sbchost.exe. These names are plays on real world programs Norton Antivirus and Windows' services svchost. On the light cycle grid near the end of the game, Mercury is resurrected and says to Jet, "Let's blow these guys to bits." The reference to blowing "these guys to bits" has the dual meaning of the blowing up physical objects to bits of debris and, also, the computing term "bit", the most basic unit of information in computing. The game suggests that the real world Tron arcade game was designed by Flynn based on his experiences in the original film. The game reveals that ENCOM's digitization technology became unusable after the destruction of the MCP, which ran the algorithms that allowed the digitization and reintegration of physical objects. Alan and Lora begin working on a new set of algorithms to regain use of the technology, but it is 20 years later before Alan is successful. The character skill called Megahurtz which allows the character to amplify the amount of damage inflicted to opponents is named after the computer term "megahertz", a unit of measurement of the clock speed of a microprocessor. During the game, the player must find permission bits which are keys that allow the player to proceed to the next level. "Permission bit" is a term used with Unix and Linux operating systems regarding the permission levels of users. The main villain of the game, the CEO of fCon, is never revealed, but it is hinted that it is actually Ed Dillinger; an email in the game has the CEO speaking of regaining control of the company (ENCOM) he used to run. This could also make it Kevin Flynn or Walter Gibbs, but it seems unlikely given the diabolical nature of the CEO. An email seen in the game with the subject of "Worried about my job!" ends with an ENCOM employee saying, "Btw, can I have my stapler back?" This may be a reference to the 1999 film Office Space in which one of the characters entreats others for the return of his red stapler which he paid for himself. The game reveals that about 1000 subjective years pass in the Electronic World for every 20 years in the real world. The game refers to the tanks as being "read-only", which means they cannot be derezzed. The term is derived from the computer term Read-Only Memory (ROM) which applies to prerecorded instructions on a computer chip that cannot be (easily) erased and which is retained even when the computer is powered down. At the end of the game, Jet and Alan are safely back in the real world and have shut down the offending fCon server. Notice that Alan's monitor screen appears to show the infamous Windows blue screen of death after the server goes down! The very last bit of dialog in the game has Jet asking his father for a copy of the Mercury program, saying he needs a good screensaver. Since there seemed to be a hint of an attraction between Jet and Mercury inside the system, Jet probably wants a screensaver of her in various poses! Much more information about the people, places, and things of Tron 2.0 can found at the Tron Wiki.